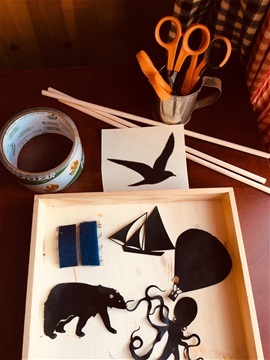 Here are 3 ways to make an image: draw one yourself and cut out OR use a Cameo Silhouette or Cricut machine to do the cutting for you OR print a silhouette image from Google images and cut. 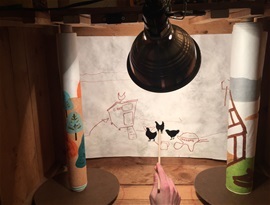 SHADOW PUPPETRY 101! 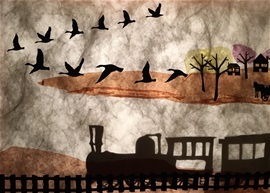 - A few people have asked me to post information about using shadow puppetry with crankies. This is the "Sue Truman Method" - very simple and basic! I hope you find it helpful. This is a scene from the 1909 crankie. It's the story of French speaking lumber workers who traveled from Quebec to Malliardville, BC to work in the Fraser Lumber Mill. A train moving along a track. Fish or whales swimming in the ocean. Ships sailing on the water. Birds, hot air balloons, blimps, flying saucers in the sky. Car traveling along a road. Bears lumbering through the forest. 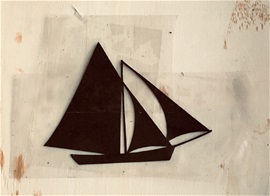 The Image - You can hand cut an image from black construction paper, or use a Cameo Silhouette or Cricut machine to do the cutting for you. Or, you can use Google Images. Here I searched for "seagull silhoutte." I printed it out and will cut out with scissors. Clear packaging tape for the front and back of the image. Scissors to cut the velcro or to cut an image. Or, if you are cutting fine detail into the image, you may want to use an X-Acto knife. 1/4" wooden dowel, cut to 12"
Cut the excess tape from around the image. Cover the back and front of the image with clear packaging tape as shown in the picture. This will make the image stiffer. Trim the excess tape away from around the image. Apply Velcro to the end of the stick and to the back of the puppet image. Cut a fuzzy velcro strip to about 1 1/2" and fold it over the tip of a 12" wooden dowel. Press it together so it sticks. 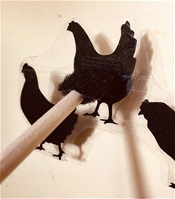 Cut a piece of the loopy Velco and stick on the back of the shadow puppet. The size of the piece depends on the size of your image. 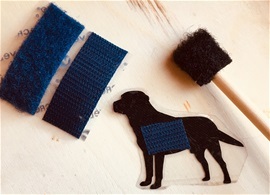 The dog image is not that big so the loopy Velcro piece was about a 1/2" long. Attach the rod to the puppet. 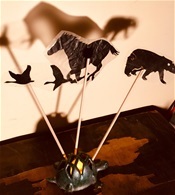 Attach the rod to the shadow puppet image so that the rod is perpendicular to the image. To get a clear puppet image on your scroll, hold the puppet so that it is touching the scroll. I use an inexpensive clamplight from the hardware store to provide light. For more information click on Illuminating the Box page of this website. I mark parts of the back of the scroll so that I know where to put the shadow puppet. In this scene, three chickens jump out of a wheelbarrow and walk over to the coop. I have outlined and labled the wheelbarrow and the coop. Carefully mark the back of the scroll so that the markings do not show on the front. I use a lighter colored marker. I put the scroll on a light box to trace the images on the back. If you don't have a lightbox, you can hold the scroll up to the window on a sunny day and that works well too! You can see I marked the back of the scroll so that Julia Derby knows where to place the shadow puppets. This crankie has a lot of puppets so I have numbered some of them on the back of the puppet. Here I was playing around with combining a hand-cranked phonograph with the crankie. I am using one hand to crank and the other hand to move the shadow puppet - challenging! Here's another early crankie using felt, fabric and lace for the scroll, making it more difficult for the shadow puppeteer!